Could Tesla become an Apple product? Lots of talk recently that Apple wants to get into the auto biz, (and is already experimenting), or risk being frozen out by Google. 19 reasons Apple might buy Tesla. Apple will buy Tesla for $75 billion in 18 months. Wait any longer and Tesla will be too expensive. Musk really is an incredible visionary. Far superior than Jobs ever was. Yeah if Apple bought Tesla they’d be buying it to get Musk. They did that before, with the NeXT acquisition to get Jobs + the technology (Mach). apple should have started on a car back when the opportunity was there (and they were competing against the old incumbents as they were with iphone v1) - its too late now and they lack the vision / opportunity to catch up. conversely tesla would be mad to sell to apple, they are the quintessential dumb money - they would need to be desperate for cash. everything good apple can offer tesla has already (including the most ambitious / talented staff) - maybe the pushy sales techniques or the artificial obsolescence? even google (lost in the weeds of vanity AI projects) has at least recognised its place and just given its cash to SpaceX as an investor. teslas problems are that it has almost too many opportunities and a key man risk in musk. apple would fix neither of those. That suggestion that Apple might buy Tesla didn’t just fall out of the sky. Tesla’s current val is $25B, has been $30B recently, not unrealistic to see it achieve $50B in the next couple of years if there is more good news. Apple is sitting on $180B in cash. Apple currently could buy something like any one of 485 companies on the S&P 500. Kinda funny to see people far removed from the situation express such dogmatic views. Something of a convergence of interests here? Utility companies should be scared of Elon Musk. His solar panels and home batteries could disrupt the industry. IS APPLE THINKING ABOUT ENTERING THE AUTO INDUSTRY? The biggest rumor of the week is that Apple is thinking about entering the automobile industry. Its product would be an electric car. Apple knows a lot about electronics, has a mountain of available cash, and has crashed into industries in which it had no experience before. In fact, that’s been its specialty. Here’s the way Tim Higgins of Bloomberg describes the current situation: ‘Apple Inc. may already be positioned to evolve into a global automaker in many ways that other Silicon Valley companies aren’t. The Cupertino, California-based tech company has put a few hundred employees to work on a secretive project to develop an electric vehicle, a person familiar with the matter has said. While Apple often tests ideas that don’t get released, the work underscores the company’s long-held desire to play a greater role in the automotive space, which is ripe for more of a merging with users’ digital lives. ‘It makes a ton of sense,’ Gene Munster, an analyst with Piper Jaffray Cos., said Saturday in an interview. ‘If you would’ve said 10 years ago, ‘Apple is going to be in the car business,’ I think people would’ve said you’re crazy – because it would’ve been crazy – and today it’s a much different company that’s able to tackle these massive addressable markets.’ Apple, with a market capitalization that’s more than $700 billion, needs to continue growing sales in iPhones, its largest revenue generator, while also expanding into new markets, such as automobiles, if it’s to reach a $1 trillion valuation, Munster said. He added that he doesn’t think Apple would bring out a car in the next five years. Nonetheless, Apple boasts some advantages versus other Silicon Valley companies with car ambitions. Tesla Motors Inc., which delivers less than 10,000 vehicles a quarter, surprised investors last month when Chief Executive Officer Elon Musk said the company wouldn’t be profitable until 2020” There doesn’t seem to be any limit to the ingenuity out there in California. Tesla is pure dot.com. And without the massive tax-payer subsidies and CARB shake downs from other car manufacturers (especially Honda) is about as real a business model as Pets.com. I spent some time a few weeks ago kicking around the main facility in Palo Alto, its the old HP building between Page Mill and Arastradero, and it looked and felt like just another dot.com. It did not feel like a real manufacturing facility, like Boeing or Lockheed. It did not feel like a car R&D facility. Like Mercedes further up Page Mill or the VW Lab beside Oracle in San Mateo. It felt like just another Palo Alto VC dot.com company. in fairness to tesla, if it is a dot.com pump-and-dump - building one the safest, fastest and most coveted cars in world is a clever marketing stunt. i’d have just run a few superbowl ads and set up an R&D Lab in Detroit beside some has been. it looked and felt like just another dot.com. It did not feel like a real manufacturing facility, like Boeing or Lockheed. It did not feel like a car R&D facility. Like Mercedes further up Page Mill or the VW Lab beside Oracle in San Mateo. It felt like just another Palo Alto VC dot.com company. Maybe you should start your research on Tesla here. Actually I agree with jmc. Reminds me of pure dot com. Articles usually start with “trillion dollar global market” or some such shite. Tesla has invested 3.1B in R&D so far according to an article in FTA yesterday. *The 2009 R&D figure includes a $23m contribution from Daimler, but that makes little difference to the overall total of $3.1bn. More spending is in prospect, with a planned battery “Gigafactory” expected to cost $4bn to $5bn by 2020, of which Tesla will contribute about $2bn, or about $400m a year. Also remember that Tesla was helped out early on by taking over a factory formerly owned by General Motors and Toyota, and you wouldn’t have Elon Musk running the show. Still, if you think all cars will one day be electric (and driverless), there is time to catch up. You would have to find staff, but assuming you are a well resourced multi-national company to start with, the numbers aren’t daunting. At the end of 2009, Tesla had 514 full time employees: 142 in manufacturing, 120 in research and development, 71 working on vehicle design and engineering, 83 in sales and marketing, 35 in services, and 63 general and administrative staff. Four years later the total had grown twelvefold to almost 6,000 employees. Musk told investors on the company’s earnings conference call Wednesday evening that Tesla (TSLA) could be worth $700 billion by 2025. And please, if that doesn’t signal a desire to exit, get real. And before you tell me that I “don’t understand” my overall problem with such a statement is that according to a very very brief look at the deeply cyclical, casualty ridden world of automobiles the entire market cap of the industry is c. 720B per Fidelity. His statement that his market cap in going to equal that reminds me of Warrens’s 2000 letter to shareholders where he explained his decision not to invest in dot coms on the basis that he and Charlie had decided that there wasn’t enough profits in the world to justify the market caps. We lower estimates and valuation, and downgrade TSLA shares to Underweight from Neutral after the firm reported softer than expected 4Q results which did not evidence the type of sharp rebound in execution we were hoping for following 3Q’s production challenges. Much of the 4Q miss was blamed on the timing of deliveries (push out from 4Q to 1Q, owing to customers being on vacation, severe winter weather, and shipping problems at year-end), although this was itself driven by continued production challenges intra-quarter which had caused assembly to be back-end weighted in the first place. But our downgrade is about more than execution risk; we note: (1) The profound drop in fuel prices harms the competitiveness relative to internal combustion engine vehicles of TSLA’s planned Model 3 mass-market car, the potential for which we believe accounts for the majority of today’s equity value; and (2) Competition is mounting – automakers at the recent Detroit Auto Show debuted a number of electrified vehicles, some of which appear directly aimed at the Tesla Model S (e.g., Mercedes C-Class Plug-in Hybrid), the X (e.g., Audi Q7 e-Tron Plug-in Diesel Hybrid), and the 3 (e.g., Chevrolet Bolt) – see takeaways from our walking tour of the show. We reduce our estimates on flow-through of 4Q’s softer sales and margin trends, and guidance for higher operating costs: 1Q15 goes to -$0.31 from +$0.93 and FY15 to $1.89 from $4.12. Our December 2015 price target-declines to $175 from $180. Friday’s news of a secret research lab in the FT there, which stirred the froth around Tesla, the electric car company run by Elon Musk. A $75bn takeover target for Apple, anyone? The problem with the theory, aside from Tesla’s mere $25bn market capitalisation, is that nobody really needs to buy Tesla. Might someone? Sure, but a glance at the company’s history shows just how little cash it took to build. The first vehicle was the Tesla Roadster, a proof of concept sports car. Total capital expenditures and research and development costs from inception to the day of the first delivery ran to about $125m. Production of a high-end sedan followed, and the development of manufacturing facilities in Palo Alto, California, was helped by a $465m loan facility from the Department of Energy, agreed in 2010 and drawn down in stages. **Tesla also struck deals with Daimler and Toyota to help fund the development of what is known as powertrain technology — the combination of battery, engine, gearbox, clutch and management software that makes an electric car move — and with Panasonic for batteries. The 2009 R&D figure includes a $23m contribution from Daimler, but that makes little difference to the overall total of $3.1bn. Set up your secret research lab and start writing cheques. Lets say you want to do it fast (four to five years) and can throw money at the project. Do you plan to spend double what Tesla did to get to this point? Triple? Even if you did (and weren’t able to find supportive governments, carmakers and battery makers to get involved) you’d still have spent less than a third of what it would cost to buy Tesla outright. A budget of $1bn to $2bn a year is not exactly small, but aluminium milling specialist Apple already spends $6bn a year on R&D. Google, the online advertising company with a sideline in driverless car technology, spends $10bn annually. In 2013 Volkswagen invested €11bn ($13bn) in property, plant and equipment, and capitalised a further €4bn ($5bn) of research spend. Or to put it another way, Tesla is a good electric car brand but is unlikely to be the only good electric car brand come 2020. While it has a head start, buying it would be an expensive and unnecessary way to catch up. the fact that Apple spend $6B a year and can only produce a bigger/smaller phone (and then buy beats…) or Google $10B putting ads on youtube suggests the real issue is not how easy it would be to copy Tesla, but how even with unlimited resources old companies are incapable of building anything new of consequence. I think Musk’s biggest worry is not electric vehicles from other manufacturers, they’ll be coming fast and thick, but hydrogen fuel cell vehicles from the majors. He has disputed that assertion, and said fuel cells are a no hope option. California will have limited numbers of fuel cell test vehicles, about 1,000 each from Toyota, Hyundai, and I think Honda, on the road this year, both for lease and sale at $57K. They will still not be as energy efficient as a current electric car, but if they ever crack that nut, then there’s trouble on the horizon for Musk. Electric cars could end up being bypassed entirely in favor of fuel cell. 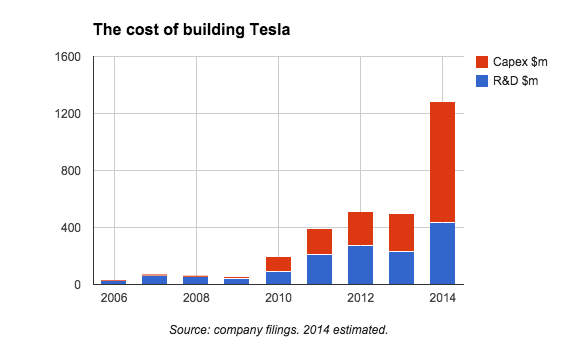 That’s one reason why Musk’s gigafactory investment is seen as a big ballsy bet. I can’t figure for the life of me simply because I haven’t the insight how a company like Toyota for example simply did not tackle this obvious next step in the car market which is electric. It’s just odd or is it? I’d rather stick to 30 years of personal experience of tech start ups. Companies that have a dot com vibe have…a dot com trajectory. And almost as long an experience with the politics of CARB. The California Air Resources Board. Without the anti-car green jihadis at CARB in the '80s and 90’s there would be no hybrids. Let alone electric cars. It was the threat of getting locked out of the California car market and the 18 states that mirror CARB regulations that created hybrids. No other reason. From a total energy balance sheet point of view they are just plain bloody stupid. If they had just applied the EPA’s CAFE mileage regulations to suv’s and light trucks they would have saved far more energy in the last 30 years than will ever be “saved” by the so called “zero emission” vehicles. Originally 50% of all cars sold in California by 2015 were supposed to be pure electric. But by the mid 90’s that complete fantasy was side steeped by classifying hybrids in the same category as pure electric vehicles. Even then and despite tens of billions of taxpayer subsidies over the last three decades the market share of hybrids in California is only about 8% and electric less than 1%. Without the massive subsides there would be no market share. Take away the hundreds of millions of ZEV credits Tesla “sells” to the other car companies who sell cars in Cal and you see just what a smoke and mirrors operation Tesla really is. Its basically just a subsidy farming operation. Just like the wind farms.